You might be thinking I’m all trendy including a recipe for Overnight Oatmeal in my blog, but I’m not. The second secret is that Overnight Oatmeal has been around for 135 years. 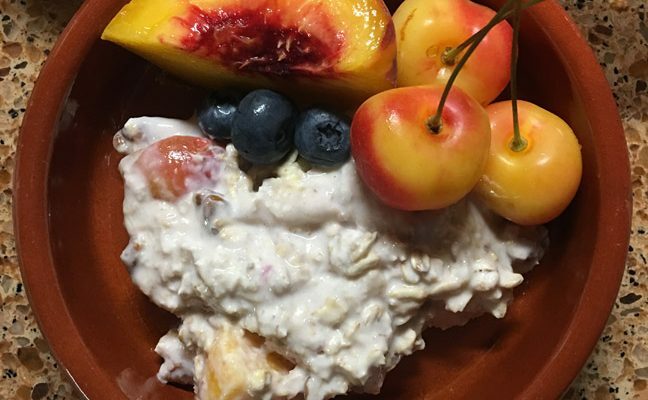 I was fortunate to travel in Switzerland about ten years ago and tasted a wonderful breakfast dish called Bircher Muesli. I loved it and when I came home, I researched the recipe. In 1883 Dr. Maximilian Bircher, a physician and nutritional pioneer, treated his patients with a concoction of oats, milk, lemon, and fruit that he called Muesli. With fresh fruits and unprocessed foods, the doctor could see improvements in the health of his patients. The original recipe calls for oats, milk, lemon juice, apples, and nuts. My first taste of muesli also included orange slices, bananas, and yogurt. 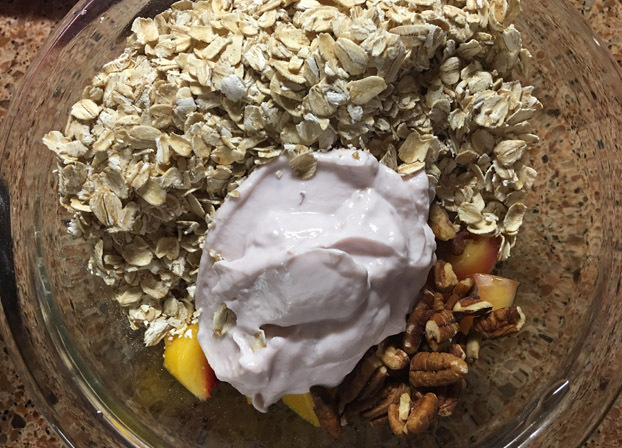 I came home from that trip and have been making Muesli ever since, often experimenting with different fruits and nuts. Maybe I am trendy after all. 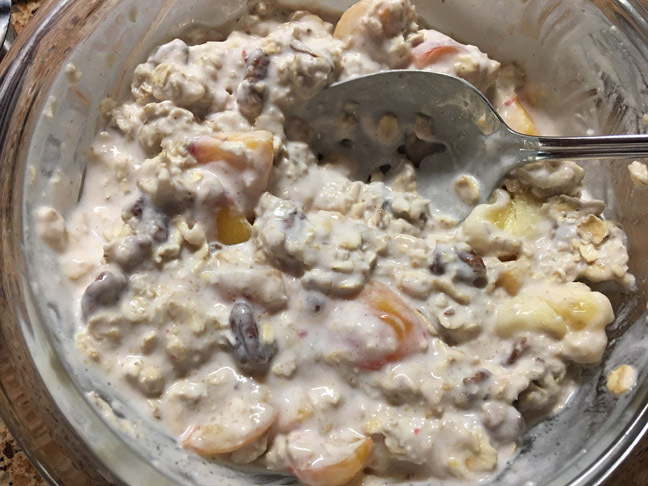 Today, I made peach muesli. 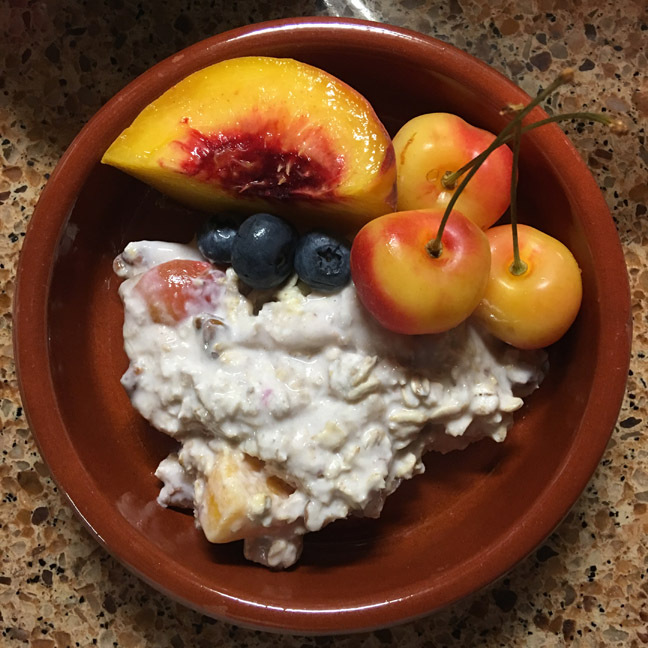 I went to Gregg Farms yesterday and bought a basket of Georgia’s finest peaches so I thought I would use them in my breakfast muesli. Today, I also exchanged the cow milk for almond milk. I feel healthier already. Now, let’s talk about consistency. I have eaten overnight oatmeal from pasty and gelatinous all the way to thin and liquid. As the oats absorb the milk, it tends to thicken. When I ate it in Switzerland it was the consistency of thick cream but very fluid. This morning, mine is on the pasty side. I personally enjoy either consistency but just know you can add additional milk and yogurt to make your desired texture. There are no rules on that end. 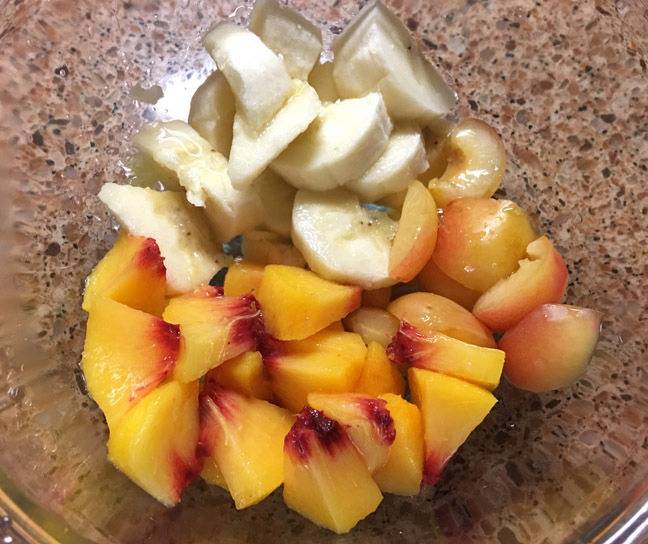 Place cut fruit in a bowl and drizzle with lemon juice. Add pecans, yogurt, oats, milk, and sugar. Stir until thoroughly mixed. Cover and store in the refrigerator overnight. Add more milk to create desired consistency. First, drizzle the fruit with lemon juice. Next, add nuts. 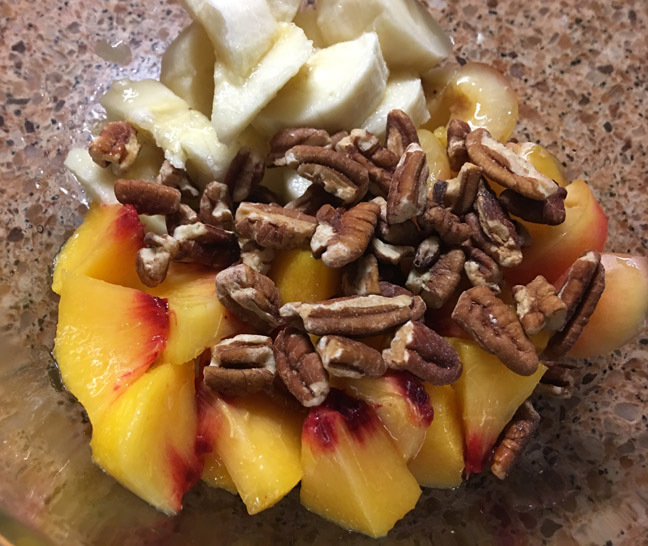 I used pecans today because I like peaches and pecans together. Add the rest oats, yogurt and milk. Stir and then refrigerate. Mine is very thick today, but you can add more milk to reach a thinner consistency. And last, serve with fresh fruit and dreams of returning to Switzerland.